In the process of fine-tuning Green Filing’s system performance, all new notifications stored on your Notifications tab will automatically be marked as “Read” if they are 45 days or older. This does not affect the delivery of courtesy email notifications, nor does it delete the notifications from your Green Filing account. All notifications will continue to be available using the Notifications tab. Please don’t hesitate to contact support at 801-448-7268, by email at support@greenfiling.com, or by Live Chat should you have any questions or concerns. Quick Tip – Did you know you can filter your notifications by case number or status? If you are looking for a specific notification it can be helpful to filter your Notification list by case number, or even status. To do so, follow these steps. Click the Notifications tab on left hand side. To filter by Case Number, on the upper right, begin typing a case number, and select a case. To filter by Status, on the upper right, click in the filter box, and select the Status you want to filter your notifications by. 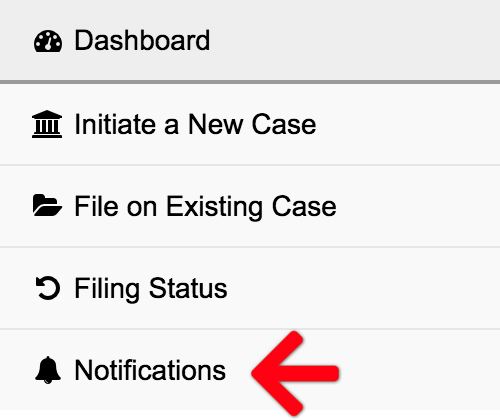 Your notifications list will now only display notifications from that case/status. To remove the filter, click the blue link of the filter displayed just above your list.